The business impacts of never ending change driven by market dynamics, regulatory demands, and technological innovations, combined with the increasing velocity of these changes, challenges every enterprise striving to remain competitive and at the top in their industry. And, as change creates new challenges, they can often generate the belief that the solution must itself be something new. This case study will present how one organization has rapidly moved to achieving leading industry levels of performance by simply taking an all-inclusive long term perspective and leveraging existing processes and technologies. The presentation will cover the key activities and critical success factors of their roadmap from definition of governing principles to the actual implementation of the final delivered solution. With the example solution being methods used to sustain the facilities PI-AF hosted asset model and how the value of the asset model is being amplified throughout the organization. Bruce is a senior management professional with more than 40 years of experience in delivering business benefits through the innovation of leading edge information technologies in the process manufacturing industries. 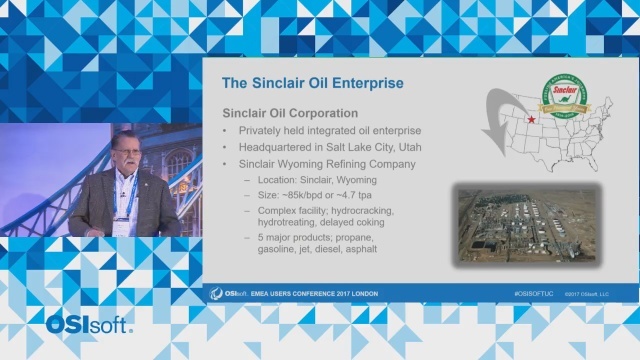 Recently retired from Suncor Energy and seeking additional outlets for his intense interests for the refining industry, Bruce joined Sinclair Oil to assist in their efforts to establish and sustain themselves as a leader in their market. Beginning his career with NASA supporting the Apollo, Apollo-Soyuz, Skylab, and various Earth Resources projects. Bruce transitioned his years of R&D experience into the private sector, initiating a long and highly successful career with major globally recognized technology product and service providers delivering large complex industry solutions. Bruce is active with AFPM, MESA, and other industry associations and a regular contributor at industry forums. Away from work Bruce is an avid motorcyclist and restoration carpenter. As the CTO of IT Vizion, Mario Brenes leads the development of all new software products. Prior to IT Vizion, he was the Director of Technical Services of IndX (a software startup) and was part of the management team during the company’s acquisition by Siemens in 2003. With his 25+ years of experience in industrial IT and automation, Mario continues to be a relentless innovator, focusing on developing products that provide a balance between new technologies and business values.